President Barack Obama has visited the scene of the Bataclan concert hall attack in Paris, after arriving in the French capital for the UN climate change summit. 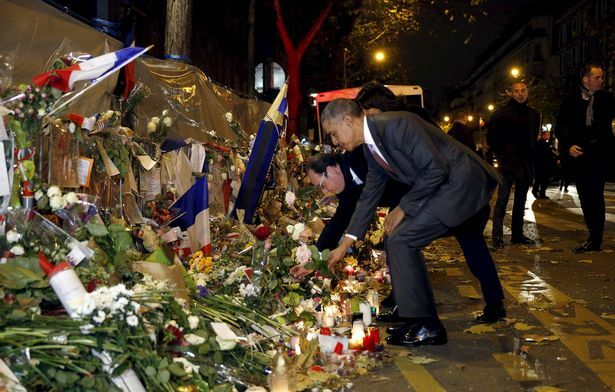 Accompanied by President Francois Hollande and Paris Mayor Anne Hidalgo, Barack Obama laid a single white rose at the venue where 90 people were killed. Security was stepped up for the visit, with helicopters flying overhead and roads in the area sealed off. About 150 world leaders are attending the climate change summit which opens on November 30. Barack Obama’s motorcade went straight to the Bataclan shortly after the US president arrived at Orly Airport. After placing his rose, Barack Obama stood in silence with his head bowed and his hands clasped in front of him. He then walked away with his arms around Francois Hollande and Anne Hidalgo. Paris terror attacks – claimed by the ISIS – on November 13 left 130 people dead and more than 360 wounded. Gunmen opened fire or set off bombs at seven locations in Paris. France is still in a state of emergency after the attacks. French prosecutors say at least 11 militants in three co-ordinated teams were involved in the killings. Nine are dead and two suspects – Salah Abdeslam and Mohamed Abrini – are still on the run. French police have carried out hundreds of raids across the country and raids have also taken place in the Belgian capital Brussels where some of the attackers were from. On November 29, more than 200 demonstrators were arrested in Paris after clashes with police. It came as climate change activists formed a human chain along the route of a march that was called off after the attacks. Some of the demonstrators in Place de la Republique were apparently protesting against France’s state of emergency, and have been disowned by the main organizers.